I served this with a very good salad that my friend Helmy made for me this summer. It has parsley, cherry tomatoes, grilled red peppers (from a jar is fine), flat leaf parsley, red onions and a splash of balsamic vinegar. I added some rocket and feta cheese. Helmy served this on thick slices of home-grown squash, yum! 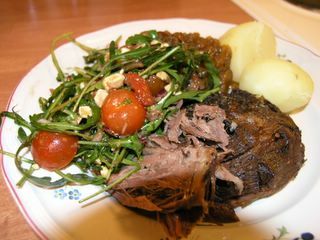 The salad worked really well with the lamb, too - the tanginess cut through the pungent richness in a divine way. We also had some simple boiled potatoes. I'll make a garlicky potato gratin to go with the leftovers, mmm! Now - go make your own lamb! It's easy! It just takes a little bit of time. Accidentally, this turned out a fairly low-carb meal - if you skip the potatoes. 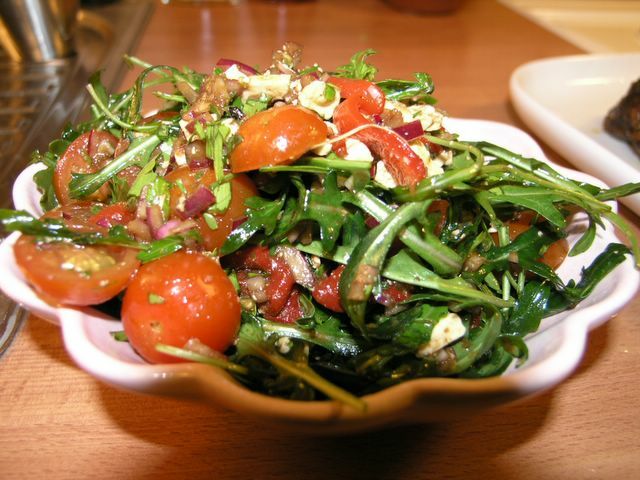 It's fairly low-fat, too - just don't use much olive oil. I threw out the pan drippings, as they were a little too oily for my likings. You need: a leg of lamb - mine weighed about 3 pounds. (Bourdain suggested 5-6 pounds.) Akso: garlic, at least 20 cloves, 2 small onions, 2 medium carrots, 2,5 dl (1 cup) of dry white wine, some flat leaf parsley, some thyme, a bay leaf or two, olive oil, salt and pepper. Preheat the oven to 150 degrees. Peel the garlic cloves. Chop the carrots into 2-3 pieces each, thinly slice the onions. Bash 3 or 4 garlic cloves with the back of your knife and slice them roughly. Make incisions all over the lamb, and stuff the garlic slivers in the pockets. Rub the lamb all over with olive oil, and season well with salt and pepper. Put in a large pot with a tight fitting lid. Add the garlic cloves, the carrots, the onions, the parsley, bay leaf and thyme. Pour over the wine. Put on the lid, and place in oven. Let it be for as long as you can stand it - watch every now and then so it doesn't go too dry. (Didn't happen for me - but I worried, since Bourdain said to seal the lid with a mixture of flour and water. Seemed a little over-pretentious to me, so I skipped it.) The garlic and onion slices will caramelize beautifully. Your Lamb looks phenomenal! My mouth is watering! Happy Easter! P.S. I just picked up Bourdain's Les Halles cookbook also, I love It! I’ve given up eating meat for Lent. Your pictures and description of the lamb almost made me lose my resolve and go to the store and get some lamb - now! You’ve also answered some questions for me. In the early 90s I was doing some work with the British Army’s DMil Survey group at the Hermitage near Reading. I had dinner one evening at a pub nearby called the Bunk. I had leg of lamb and it was the best meal I’ve had in the UK. The proprietor told me he cooked 8 to 10 legs at a time in a large baking pan. He made a mirepoix of zucchini, onion and carrot and put the lamb on top after he seasoned it with salt,pepper and rosemary. 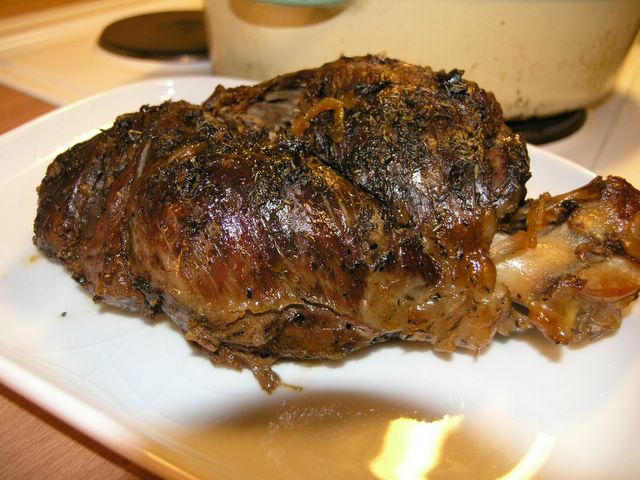 He added a cup of lamb broth per leg and baked the lamb at a low temperature for about 8 hours. At about 6 hours, he added a glass of port for each leg and stirred in a tablespoon of black current jelly for each leg. He told me I could get lamb broth cubes at Sain’s to take back to the US with me. A few years later, I was staying at my father’s while he recovered from breaking his leg. He mentioned that he had not had lamb since he was in England in WWII. I didn’t have all the ingredients, so I had to improvise. I got a boneless leg of lamb. I untied it, rubbed it with olive oil and seasoned it with salt, pepper, garlic and rosemary. I retied it and browned it slightly in a little olive oil. I then set it in a baking pot on a mirepoix of onion, celery, and carrots. I used chicken broth in lieu of lamb broth and my father didn’t have any port, so I used a sweet Rhine wine my brother had brought back from Germany. I also didn’t have any black current jelly, so I used grape jelly instead. I set my oven to 150° C and put the pan in the oven with the lid on. I had planned to cook it five hours. It was raining and cold and my father wanted to take a nap, so I went to the Library to read. I came back three hours later and when I checked the lamb, the liquid had been reduced about one half and was very dark. I thought I had the temperature too high and had burnt it. However, when I tasted the broth it was rich and savory. The lamb was even better than I had had in the UK. I’ve always wondered if it would have been better if I had used a lower temperature for a longer period of time. Your use of 150° C and Bourdain’s saying to seal the lid with a mixture of flour and water in his recipe tells me I was right on with the temperature and to use a pot with a good sealing lid. Danno - I'll trade you for some of your amazing home-made sausage. I'm drooling every time I read your blog! Aardvarknav - thank you so much for sharing all that! Lent is almost over, isn't it? (Um, tomorrow...?) I love the suggestions for cooking lamb - I'll definitely be playing with variations with this recipe! I think you could go even a little lower than 150, depending on the size of the lamb. I'll definitely try the jelly - I think I had a little too much olive oil (I was scared it'd go dry since I didn't bother with the sealing) and the pan turned quite greasy - I'll use less next time, and make some sort of gravy from it. Oh my god..i had already cooked this recipe..its really great and yours looks fantastic! A big huge from brazil!